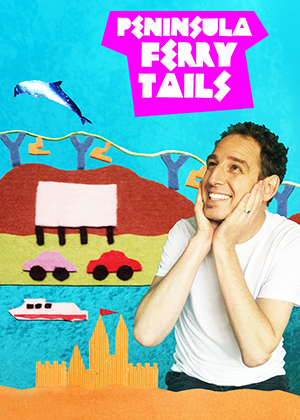 This is a delightful play for children yet it also has plenty in there for the adults to enjoy as we all go on a crazy journey with Frank Stone (note the pun) to find the Peninsula tails (or tales). High participation was encouraged from the start as the performer engaged the children in silly questions and animal balloon making. Simple props and costumes helped add to the fun and there was no shortage of convicts, fishermen, dogs and shark volunteers. “Peninsula Ferry Tails” is a frolicking adventure due to the energy and expressive skills of the actor playing Frank Stone and the witty script. The performer certainly knew how to work a crowd from humourously telling a child to stop making noises with his balloon, to incorporating random questions/comments from the kids into the show and quipping one liners for the adults. I was quite exhausted by the end just from watching his boundless energy and vocal expression, in fact I worried he might lose his voice! Many references to local icons were included in the clever script. A favourite of mine being Arthur’s Seat, Frank Stone’s teddy bear that was sitting on his seat and then the dramatic break down of the chairlift. Also Melbourne’s key figure of Batman (not the superhero) and the eating of Pal provided more laughs. Every place you would expect to be in there was like Sweet Water Creek and the Aboriginal story of the eels racing along it, Rosebud banksias and Sand Sculptures. I loved the Dromana Drive-In at the end with the screen set up showing a film of Frank Stone at most of the play’s locations. It tied it up all rather neatly and just in time too as I think the play was nearly getting to its concentration time limit for the younger kids. “Peninsula Ferry Tails” is a fun, energetic play that certainly entertains, educates and celebrates our wonderful part of the world. Well done to all involved!